I shared yesterday an example of how a big tax increase on expensive homes led to fewer sales. Indeed, the drop was so pronounced that the government didn’t just collect less money than projected, which is a very common consequence when fiscal burdens increase, but it actually collected less money than before the tax hike was enacted. That’s the Laffer Curve on steroids. The purpose of that column was to share with my leftist friends an example of a tax increase that achieved something they desired (i.e., putting a damper on sales of expensive houses) in hopes of getting them to understand that higher taxes on other types of economic activity also will have similar effects. And some of those “other types of economic activity” will be things that they presumably like, such as job creation, entrepreneurship, and upward mobility. I now have another example to share. The New York Times is reporting that a Mexican tax on soda is causing a big drop in soda consumption. In the first year of a big soda tax in Mexico, sales of sugary drinks fell. In the second year, they fell again, according to new research. 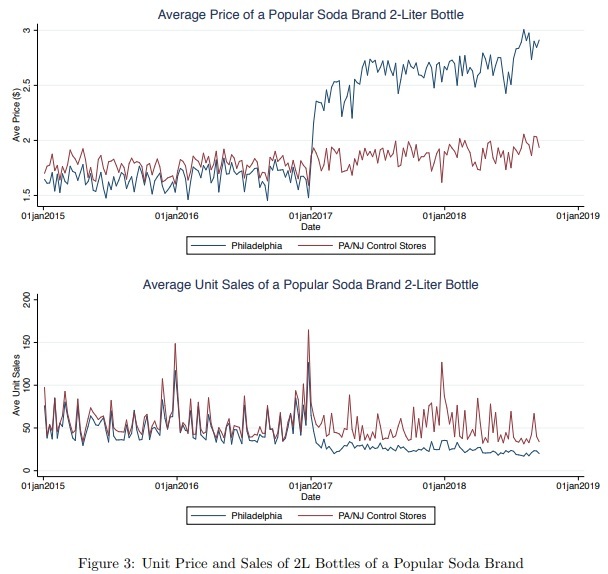 The finding represents the best evidence to date of how sizable taxes on sugary drinks, increasingly favored by large American cities, may influence consumer behavior. This is an amazing admission. Those first three sentences of the article are an acknowledgement of the central premise of supply-side economics: The more you tax of something, the less you get of it. 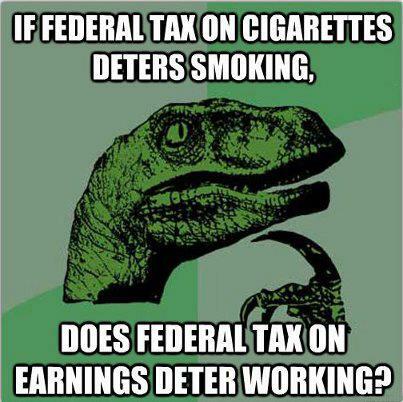 In other words, taxes do alter behavior. In the wonky world of economics, this is simply the common-sense observation that demand curves are downward-sloping. When the price of something goes up (in this case, because of taxes), the quantity that is demanded falls and there is less output. And here’s another remarkable admission in the story. The effect of taxes on behavior can be so significant that revenues are impacted. The results…matter for policy makers who hope to use the money raised by such taxes to fund other projects. …some public officials may be dismayed… Philadelphia passed a large soda tax last year and earmarked most of its proceeds to pay for a major expansion to prekindergarten. City budget officials had assumed that the tax would provide a stable source of revenue for education. If results there mirror those of Mexico, city councilors may eventually have to find the education money elsewhere. Wow, not just an admission of supply-side economics, but also an acknowledgement of the Laffer Curve. Now if we can get the New York Times to admit that these principle also apply to taxes on work, saving, investment, and entrepreneurship, that will be a remarkable achievement. P.S. Leftists are capable of amazing hypocrisy, so I won’t be holding my breath awaiting the consistent application of the NYT‘s newfound knowledge. P.P.S. 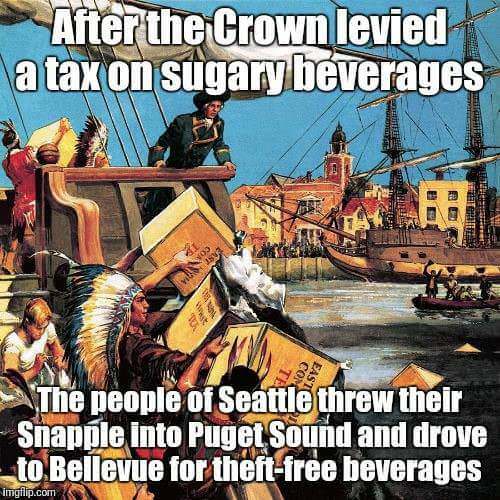 Just because some folks on the left are correct about the economic impact of soda taxes, that doesn’t mean they are right on policy. As a libertarian, I don’t think it’s the government’s job to dictate (or even influence) what we eat and drink. What Can We Learn When the Pro-Tax Hike Crowd Says “Oops”? I don’t like tax increases, but I like having additional evidence that higher tax rates change behavior. So when my leftist friends “win” by imposing tax hikes, I try to make lemonade out of lemons by pointing out “supply-side” effects. Such as the big drop in soda purchases after a tax on sugary drinks was imposed in Berkeley. Such as the big drop in home sales after a tax was imposed in Vancouver on purchases by foreigners. 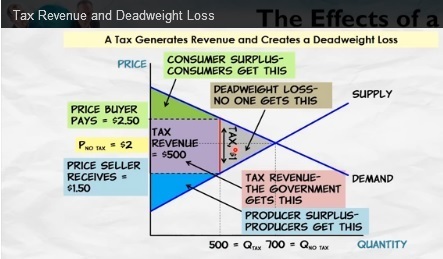 I’m hoping that if leftists see how tax hikes are “successful” in discouraging things that they think are bad (such as consumers buying sugary soda or foreigners buying property), then maybe they’ll realize it’s not such a good idea to tax – and therefore discourage – things that everyone presumably agrees are desirable (such as work, saving, investment, and entrepreneurship). Though I sometimes worry that they actually do understand that taxes impact pro-growth behavior and simply don’t care. But one thing that clearly is true is that they get very worried if tax increases threaten their political viability. This is why Becket Adams, in a column for the Washington Examiner, is rather amused that Mayor Kenney of Philadelphia has been caught with his hand in the tax cookie jar. Philadelphia Mayor Jim Kenney fought hard to pass a new tax on soda and other sugary drinks. He won, and the 1.5-cents-per-ounce tax is now in place, affecting both merchants and consumers, because that’s how taxes work. Businesses pay the levies, and they offset the cost by charging higher prices. That is as basic as it gets. The only person who doesn’t seem to understand this is Kenney, who is now accusing business owners of extortion. “They’re gouging their own customers,” the mayor said. Yes, consumers are being extorted and gouged, but the Mayor isn’t actually upset about that. He’s irked because people are learning that it’s his fault. Philadelphians are obviously outraged by the skyrocketing cost of things as simple as a soda, which has prompted some businesses to post signs explaining why the drinks are now do damned expensive. 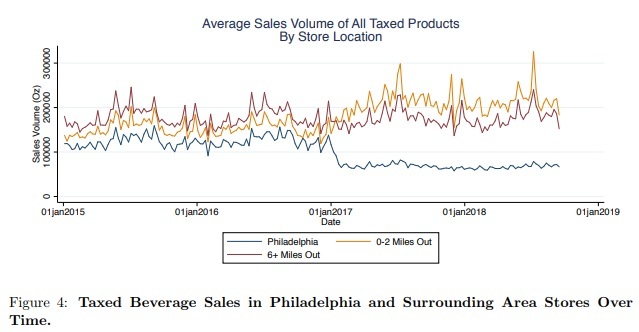 Kenney said that this effort by businesses to explain the rising cost is “wrong” and “misleading.” The mayor apparently thought the city council could impose a major new tax on businesses, and that customers somehow wouldn’t be affected. In other words, it’s probably safe to say that Mayor Kenney has no regrets about the soda tax. He’s just not pleased that he can’t blame merchants for the price increase. The International Monetary Fund, by contrast, may actually have learned a real lesson that higher taxes aren’t always a good idea. That bureaucracy is infamous for blindly supporting tax increases, but if we can believe this story from the Wall Street Journal, even those bureaucrats don’t think additional tax hikes in Greece would be a good idea. IMF officials have said Greece’s economy is already overtaxed. New taxes that came into affect on Jan. 1 are squeezing household incomes further. Economists say even-higher income taxes—in the form of lower tax-free income allowances—could add to a mountain of unpaid taxes. Greeks currently owe the state €94 billion ($99 billion), equivalent to 54% of gross domestic product, and rising, in taxes that they can’t pay. Here are some stories to illustrate the onerous tax system in Greece, starting with a retired couple that will probably lose their house because of a new property tax. I’ve already written about this punitive property tax. The good news is that property taxes generally are transparent, so people know how much they’re paying. The bad news is that the tax in Greece is far too onerous. And I’ve also noted that small businesses are being wiped out in Greece as well. The WSJ has a new example. Tax increases under previous rounds of austerity have put a middle-class lifestyle beyond reach for many. “Our only goal now is survival,” says arts teacher Mimi Bonanou. Until recent years she also made a living as a practicing artist, selling her works in Greece and abroad. But increasingly heavy taxes that self-employed Greeks must pay at the start of each year, based on the state’s often-ambitious forecast of their incomes, have forced her to rely on teaching alone. All things considered, Greece is a painful example that a country can’t tax its way to prosperity (though some politicians never learned that lesson). Moreover, it’s nice to have further evidence that even the IMF recognizes that Greece is on the wrong side of the Laffer Curve. And if a left-leaning bureaucracy is now willing to admit that excessive taxation can lead to less revenue, maybe eventually the Republicans on Capitol Hill will install people at the Joint Committee on Taxation who also understand this elementary insight. Back in 2010, I joked that the Libertarian Party should give Barack Obama a Man-of-the-Year Award because his failed policies rejuvenated interest in limits of federal power. Though, in retrospect, perhaps the GOP should have given Obama the Award since Republicans reaped the short-term benefits. In any event, let’s not get distracted by electoral politics. That’s because we have another tongue-in-cheek award. It’s time for the Libertarian Party to give its Woman-of-the-Year Award to Michelle Obama. Why? Because the First Lady has single-handedly managed to discredit the federal government’s program to subsidize school lunches. In short, there are now all sorts of federal regulations and mandates that have simultaneously made the program most costly for schools and resulted in food that is less appealing to students. In other words, she’s helping to teach the next generation that big government makes your life less pleasant. That’s usually a lesson young people don’t learn until they get their first paycheck. Let’s look at the results of Ms. Obama’s handiwork. Citing a report from the Government Accountability Office, the Wall Street Journal opines on how Washington has made the school lunch program become far less appealing. Though I’m glad to see that some local governments and students are engaging in civil disobedience. “…two had nevertheless been serving pasta that was not in compliance with the whole grain-rich requirement.” …The auditors found students in two schools who carried contraband salt shakers. Gasp! Non-compliant pasta and contraband salt?!? Surely it’s time to sic the IRS on these scofflaws. Or maybe we should learn a different lesson, which the WSJ succinctly identifies. This exercise has been an epic waste of food and taxpayer money. Some statist readers doubtlessly are saying that the higher cost is worthwhile because students (even if they don’t like it) are being forced to eat healthier. Amazingly, the federal government managed to decrease consumption of fruits and vegetables (FV) even though that’s one of the main goals of the new rules. Here’s an excerpt from a scholarly study. Since 2012, the USDA’s requirement that children select FVs at lunch as part of the reimbursable school meal has been met with concern and evidence of food waste. We compared elementary schoolchildren’s FV selection, consumption, and waste before (10 school visits, 498 tray observations) and after (11 school visits, 944 tray observations) implementation of this requirement using validated dietary assessment measures. More children selected FVs in higher amounts when FVs were required compared with when they were optional (0.69 cups vs. 0.89 cups, p,0.001); however, consumption decreased slightly (0.51 cups vs. 0.45 cups, p50.01) and waste increased (0.25 cups vs. 0.39 cups, p,0.001) when FVs were required compared with when they were optional. As reported by the Washington Examiner, even the School Nutrition Association is not exactly happy with the federal government’s nanny-state approach to school lunches. Schools nationwide are being forced to raid their education budgets to cover the costs of federally-mandated school lunches, rejected by students because they taste bad, according to a group the represents school nutrition professionals. Once a profit center for schools, cafeterias have become a financial black hole… And the deficits are being made up by cafeteria worker firings and budget shifting, according to the School Nutrition Association. The Washington Examiner story represents an interesting development since it’s a sign of a schism between two interest groups – government workers and nanny staters – that normally are part of the same coalition. So further kudos to Ms. Obama for causing discord on the left. Though when push comes to shove, the nanny staters lose. Here’s a real-world example of how the federal government has botched the program. A Montana school board has decided it makes more sense to reject handouts from Uncle Sam. Bozeman school board members voted 5-3 to pull the high school out of the National School Lunch Program because federal regulations on calories, fat, sugar, sodium, whole grains and other nutritional elements championed by the first lady were driving students off campus for lunch… School officials realized it was financially advantageous to forgo $117,000 in federal food subsidies tied to the National School Lunch Program to draw students back into the cafeteria, and it seems they were correct. …Across the district, the food service program is $1,441 in the black so far for the 2015-16 school year. The food service budget ended last school year $16,000 in the red… And school food service workers told board members students are now getting high quality food from local sources, rather than pre-packaged meals promoted by the government. Let’s now shift gears and look at other ways the federal government screws up when it gets involved with what goes in our stomachs. For years, bureaucrats in Washington have tried to tell all of us, not just students, what we should eat and drink. Well, it turns out that they were giving us bum advice. Here are a few excerpts from some analysis in the Washington Post. U.S. dietary guidelines have long recommended that people steer clear of whole milk… Whole milk sales shrunk. It was banned from school lunch programs. Purchases of low-fat dairy climbed. “Replace whole milk and full-fat milk products with fat-free or low-fat choices,” says the Dietary Guidelines for Americans, the federal government’s influential advice book, citing the role of dairy fat in heart disease. Not so much. At least if the goal is better health. …research published in recent years indicates that the opposite might be true: millions might have been better off had they stuck with whole milk. Scientists who tallied diet and health records for several thousand patients over ten years found, for example, that contrary to the government advice, people who consumed more milk fat had lower incidence of heart disease. By the way, it’s not just whole milk. One of my Cato colleagues, Walter Olson, points out that the government has a long track record of botching recommendations. Previous advice from Washington about the supposed hazards of eggs and other cholesterol-laden foods, the advantages of replacing butter and other animal fats with trans fats, and the gains to be made from switching from regular to diet soda, have all had to be re-evaluated and sometimes reversed in later years. So what lessons should we learn? Let’s turn to David Boaz, another colleague from the Cato Institute. He succinctly explains that government shouldn’t be involved in our diets. It’s understandable that some scientific studies turn out to be wrong. Science is a process of trial and error, hypothesis and testing. Some studies are bad, some turn out to have missed complicating factors, some just point in the wrong direction. I have no criticism of scientists’ efforts to find evidence about good nutrition and to report what they (think they) have learned. My concern is that we not use government coercion to tip the scales either in research or in actual bans and mandates and Official Science. Let scientists conduct research, let other scientists examine it, let journalists report it, let doctors give us advice. But let’s keep nutrition – and much else – in the realm of persuasion, not force. First, because it’s wrong to use force against peaceful people, and second, because we might be wrong. This last point reflects the humility that is an essential part of the libertarian worldview. Let’s close with one final example to demonstrate the bad things that happen when the federal government gets involved with food. Writing for the Foundation for Economic Education, my old buddy Jim Bovard explains how biased bureaucrats are deliberately exaggerating hunger in America. But this doesn’t mean anyone is going without food, as Jim notes. Needless to say, statists predictably use the federal government’s biased stats to push for…you guessed it…more government! After the 2009 USDA food security report was released, President Obama announced that “hunger rose significantly last year. … My administration is committed to reversing the trend of rising hunger.” …USDA food security reports, by creating the illusion of a national hunger epidemic, have helped propel a vast increase in federal food aid in recent years. …The insecurity = hunger switcheroo is also fueling campaigns to compel schools to give free breakfasts to all kids after school starts each day. …USDA has never attempted to create an accurate gauge to measure actual hunger. Instead, citizens are supposed to be satisfied with federal reports that are little more than a subsidy for political grandstanding. I know what lesson I hope people learn from the deceit, waste, and foolishness discussed today. We should end any role for the federal government in food. That means ending all the misguided programs discussed above. It also means abolishing the food stamp program and letting states decide whether such subsidies are desirable. And it means shutting down the entire Department of Agriculture. Like all sensible libertarians, I don’t like the idea of having the federal government in my wallet or my bedroom. Perhaps we also need to say we don’t want Washington in our stomachs either.